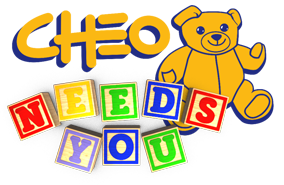 CHEO Needs You is a 30 minute television show that will introduce you to four CHEO patients, their families and some of the CHEO staff who care for them. A visit inside the Ottawa Children’s Treatment Centre (OCTC) and Roger Neilson House will demonstrate the breadth of services available at CHEO. Please tune in to CTV Ottawa on October 9 at 6:30 p.m. to meet 15 year old cancer patient Tyra Liko and her family who are with her every step of the way. You will be inspired by four-year-old Malakai Richter who suffered a stroke while still in the womb and is now making great strides thanks to the combination of learning and therapy he receives at OCTC. You will learn about support services available at Roger Neilson House through the eyes of one family who lost a child and get an update on innovative work being done at the CHEO Research Institute. We hope you will be inspired by these touching stories. All donations made by phone or online during the show will be matched up to $10,000 thanks to our sponsors Surgenor Automotive Group and TELUS!